We know that Nature is good for us. As children breathe in fresh air, see vibrant colors, feel different textures and connect with busy living creatures and plants, they come to feel more alive, grounded and integral. We’d love to take our children hiking in the woods every weekend, but that isn’t practical for most of us ~ or even necessary. There are ways to recognize how Nature is at the center of our lives. There are additional ways to bring the healing, restorative and protective gifts of Nature into our homes, lives and bodies. We’ve put together products and services to make it easy for you to give your children these gifts. Let us bring Nature right to your door in a way that supports your life instead of adding another task for you to do. We’ve created a box of treasures to allow you and your child to develop an intimate relationship with Nature. This treasure box includes a guide book filled with activities, explorations and information as well as flower essences, herbs and other discoveries from the forest floor. Your child will delight to receive mail just for them, and to open the box and discover items from the woodlands that they can touch and feel. This gift will inspire their curiosity, imagination, connection to the natural world, tactile and sensory development, and the peaceful feeling we all get when beholding something beautiful from nature. For more details about Graybear’s Treasure Box, click here. There’s nothing more restorative to you and your child than healthy sleep, and yet, with young children, sometimes nothing seems more elusive. 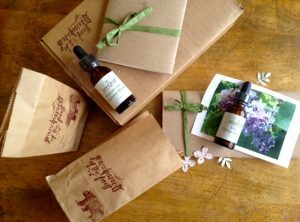 We’ve created a guide kit with wisdom from the Elders (in line with modern science) and flower essences and other natural gifts of Nature that support deep rest. Need help choosing the appropriate Flower Essence or would you like your own custom blend? Help is just an e-mail away. Deb has a deep connection to the heart and soul of both flowers and people. She’s here to help you select the right flower essence(s) to be your ally and aide. Let her guide you through an individualized process of flower essence selection. 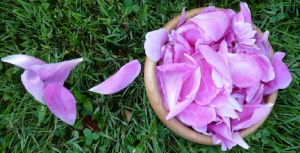 Learn more about Deb’s Flower Essence Consultation by clicking here. 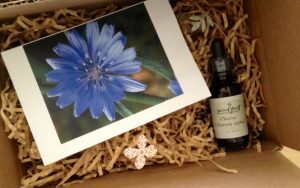 Instead of sending flowers, you might send a Sacred Forest custom flower essence “bouquet” as a deeply personal gift for a child or an adult you love. Imagine what a delight it would be to open the mail and discover a small box tied with colored raffia or ribbon, and to find, inside, a beautiful bottle of specially blended flower essences from a loved one. Alongside the special custom blend would be a note from Deb, explaining the gifts of each flower, gifts chosen by the giver. Are you facing a parenting or family challenge that you’d like to address naturally, and instead of reading every book and blog post, you’d just like to ask someone what to do? We’ve been there, and we can help. Parents have used single mentorship sessions to ask questions about growing their own food, flower or herb garden as well as asking questions about taking their child out in the wild world of Nature. Other parents have asked for guidance and support for dealing with simple childhood illnesses or emotional challenges. And yes, most everyone has questions about sleeping soundly. We’re here for you ~ ask away! Get details about the Single Session Mentorship by clicking here. Connecting to Mother Nature is essential for our health, wellbeing and vitality. 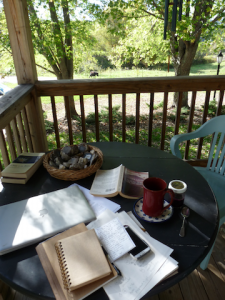 Each season offers its own set of gifts and challenges. By harmonizing with the cycles of the Earth, paying attention to the changes throughout the year, using foods and herbs in accordance with the seasons and attuning to the elements you will find peace and joy. Let Deb help you, dear momma, to remember the way of the Great Mother. You’ll receive a custom-made box of appropriate seasonal herbs and flower essences as well as a guidebook of ideas, suggestions and Nature adventures for you and your little ones. You’ll also receive special treasures from Nature that will delight your children. Elia also delights in writing to your children throughout the year as a pen-pal. For more details about the mentorship with Deb, click here. A portion of all Grandparents of the Forest profits go to supporting Wild Earth, a 501(c)3 non-profit, founded in 2004 and based in New Paltz, NY. Wild Earth offers profound and timeless experiences that help children grow in confidence and self-reliance within Nature. They are deeply committed to bring Wild Earth to underserved youth in urban areas. As we all join hands and return to the arms of Nature, we face a bright future!